TIMco, one of the UK’s largest independent wholesale suppliers of screws, fixings and power tools accessories, has developed a brand-new range of TIMco Multi-fix 9 in 1 Adhesives and Sealants with a ground-breaking formula. The TIMco Multi-Fix 9 in 1 Instant Grab Adhesive has been developed to give superior rapid bonding strength to a wide variety of building materials, even in wet conditions. The instant grab formula can eliminate the need for permanent and temporary support and be painted over almost immediately. Furthermore, the Multi-Fix 9 in 1 Instant Grab Adhesive is capable of setting in as little as 15 minutes and provides superior strength, supporting loads up to 400kg. 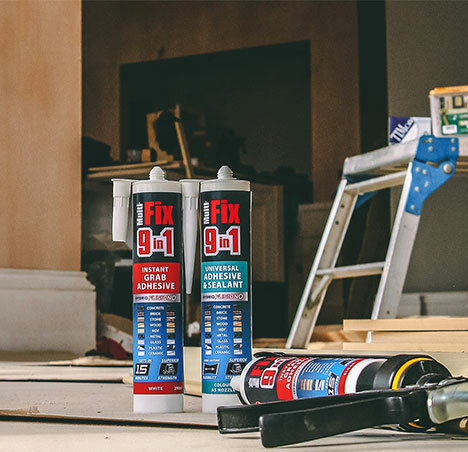 The Multi-Fix 9 in 1 Universal Adhesive & Sealant has an advanced formula which provides a replacement for both traditional adhesives and sealants, giving a noticeably professional finish. Having also been ISEGA approved, the adhesive is suitable for use in food preparation areas. Using a revolutionary hybrid polymer technology, the TIMco Multi-Fix 9 In 1 Universal Adhesive & Sealant, adheres to most traditional building materials, including; concrete, brick, stone, wood, MDF, metal, glass, plastic and ceramic. It has been developed for the use in a wide variety of trade and DIY applications. The new Multi-Fix Adhesives and Sealants range will be included in TIMco’s 2018/19 catalogue.